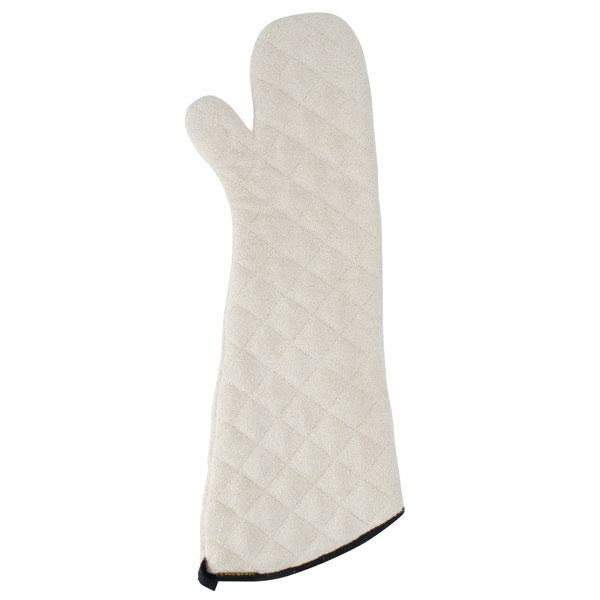 Protect your hands from hot pots and pans with these San Jamar 824TM 24" terry oven mitts. 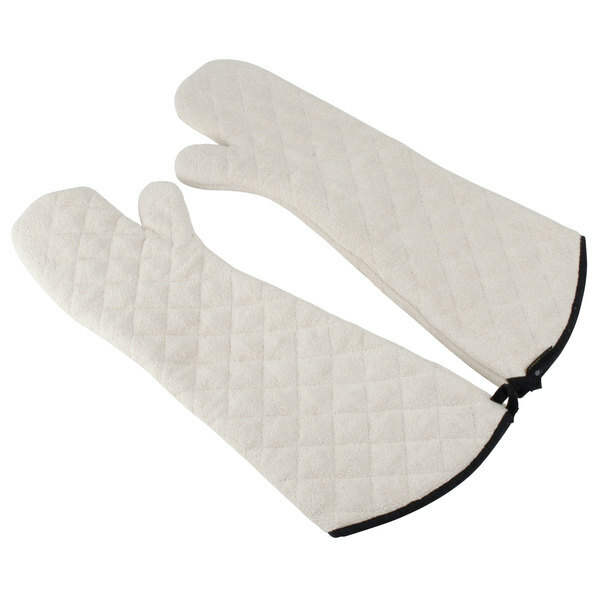 Made of heavy duty institutional grade terry cloth, these oven mitts are designed to withstand temperatures up to 500 degrees Fahrenheit for 30 seconds. They are perfect for a busy commercial kitchen with cooks handling multiple pots, pans and other items going in and out of the oven. These kitchen tools would also be great for any catering business or hotel kitchen that navigates a busy dinner rush on a regular basis. These oven mitts have an extra-long length of 24" providing heat protection for your entire arm! 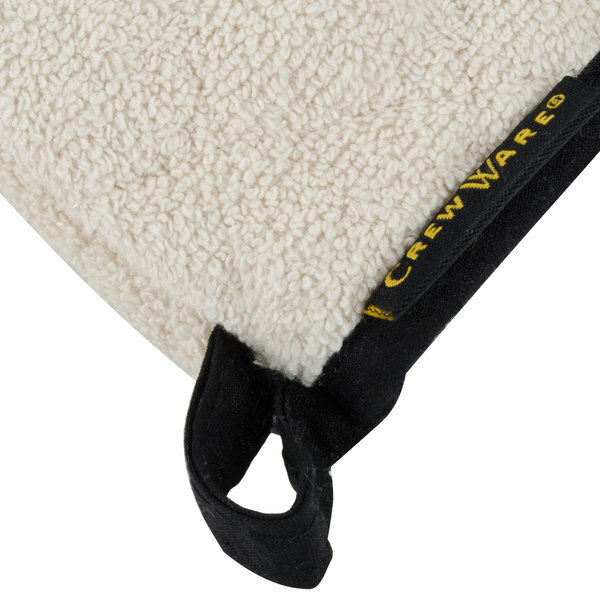 Handy hooks sewn into the mitts allow for easy storage after a busy day in the kitchen. Don't miss out on this easily overlooked item that can vastly improve your cooks' culinary performance. This item protects hands against steam. This item protects hands against heat. Great mitts with very good coverage. 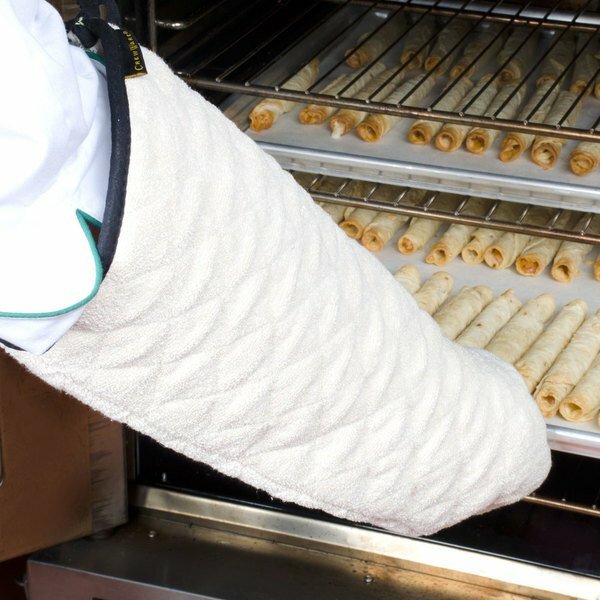 Holds sheets pans out of 450 oven with ease. Would be great for large wood or coal fired ovens for pizza makers. Great oven mitts for the price. I just wish they were in grey vs. white to minimize how quickly they'll look so stained from handling the sheet pans. too bulky. didn't really protect my actual hands from getting too hot. also "thinned out" in the washing machine and didn't feel as thick and padded. We love these oven mitts. They do wear out over time, but when you use them every day, that is to be expected. Highly recommend these to help prevent burns. These were bought as a gift for someone that severely burned themselves taking something out of the oven. If they wear these, that will never happen again. The are very well made and large enough to cover your whole arm. Great material - good quality Terry Cloth and have lasted a long time in our commercial kitchen, the length seems a little excessive for our daily use. Would be great for reaching into deep ovens, etc. These oven mitts are perfect for handling the large size sheet pans. They cover our arms above our elbows so that we feel fully protected. These have been great at keeping arms protected, and are quite resistant to heat. They definitely get more noticeably dirty because they're white, but they've held up to washing surprisingly well! Really great oven mitts! They are extra extra long so you can put your hands all the way in the oven with no issue of getting burnt. Wow this oven mitts are phenomenal. I took some steak out of the broiler at home and the temperature was well above 500 Degrees I guess somewhere around 800 Degrees and I didn't even feel anything warmth through these. I will definitely recommend and I will definitely buy them again. 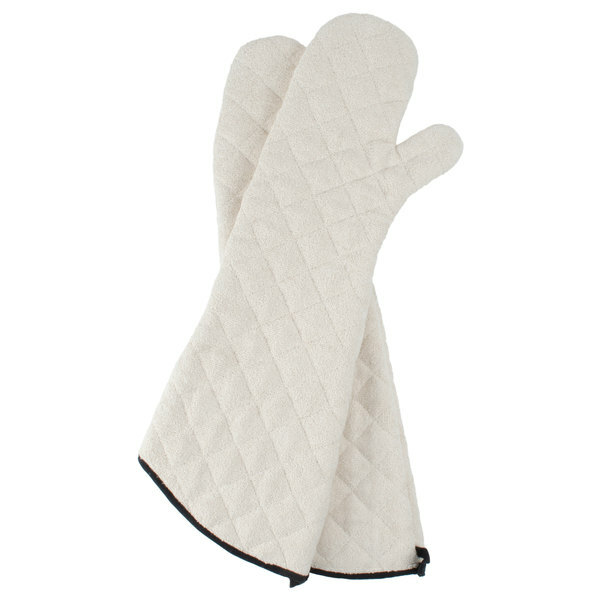 We love these gloves for moving full sheet pans through the kitchen. They are plenty thick and the sleeves go well above the elbow. They are the second most used gloves in the kitchen. We get about 3 months out of each set of these oven mitts. They eventually get worn down and you find out they need to be replaced when you pick up a hot pan and get burned through a spot in the glove that's been worn down. Thick and protective! I got these for my kids to bake with, they really enjoy them. The mitts are quite long, so they go up their arms almost all the way. But no worries about burning anything when they put things in and out of the oven. Good product. These things are fantastic. They're even longer than they appear to be - I'm an average-sized guy and they come up to my biceps. Genuinely impressive heat resistance and they've also survived a trip through the wash. Recommended. These gloves have worked amazingly well! Got them as a gift from a friend for our bakery because we were burning ourselves once in a while bt with the extra long sleeve, no more burns! Would highly recommend to others. Will be buying a few more in the coming weeks. I never got another burn on my hands and arms while baking bread again. They are vey thick and long. I can reach all the way into the back of the oven with these and lift very heavy items without feeling high temperatures. The length of these oven mitts is outstanding. They're perfect for ovens that are raised off the ground and have a hot door that must be reached over. Provides protection all the way up to the bicep. the girls love using this glove as it protects them most of the way up to the shoulder. Its a must have for cautious bakers.